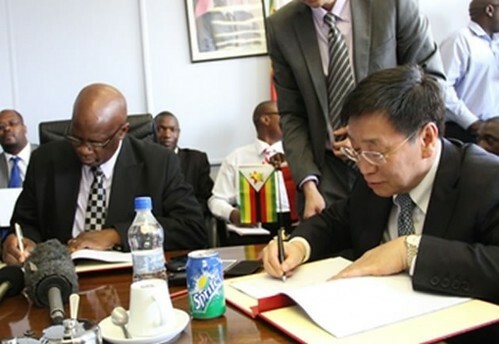 Republic of Zimbabwe Minister of Finance Patrick Chinamasa along with Vice-President of the People's Republic of China Import-Export Bank Zhu Hongjie signing a $318 million hydro power contract in Harare., a photo by Pan-African News Wire File Photos on Flickr. FISCAL policy should be a tool used to either decelerate or stimulate the gross domestic product growth rate depending on the economic situation and in Zimbabwe’s case there was a need to stimulate the economy and this budget falls short on achieving that goal, but rather is a cocktail of stabilisation packages that should lay the foundation for future economic growth. The 2014 National Budget was in some way admittance and acceptance by our government of the key challenges facing the nation away from the usual sanctions rhetoric. Finance and Economic Development Minister Patrick Chinamasa in a way tried to balance the aspirations of the new economic blue print, the Zimbabwe Agenda for Socio-Economic Transformation, which seeks to foster economic growth buttressed by increased public and private investment in the economy. With a little sacrifice anything that is broken can be fixed, and Zimbabwe is no exception. The budget maintains the Government’s strategies and sets out the direction to maintain a stable macro-economic environment especially when one considers the sluggish global economic outlook characterised by low commodity prices, declining growth rates, and problems in the Euro-Zone among others. It was important that the minister set the record straight concerning the use of multiple currencies and must continue to do so as and when the need arises, as in the past few months after the election a lot of rumours about the re introduction of the Zimbabwe dollar have been causing a lot of uncertainties and affecting consumer and business confidence. Chief among the economic challenges is the prevailing environment of tight liquidity which the Minister Chinamasa rightly put, is weakening aggregate demand (total demand for goods and services in an economy) hence slowing down economic growth. This saw a downward revision of projected economic growth from 5 percent to 3,4 percent for the 2013 financial year. Although the normal course of action would have been to introduce tax cuts in order to stimulate aggregate demand; however given our current circumstances the government needs every cent in its coffers and it comes down to affordability of the Government to finance the tax cuts. The focus of this budget was to create a certain level of confidence that could bring in the much need investment to stimulate economic growth. The government should realise that we live in a world of scarce capital and therefore capital always flows where it is in the best interest of owners of such capital, unless of course a country has a resource that can allow the bending of the rules, the Chinese have over a billion people which translates into a large market and the Arabs have oil and these become exceptions. The reduction in money supply and credit, exacerbated by a decrease in Government and private investment spending as well as a threats of more bank failures has now ushered in a new threat to the economy. Zimbabwe is now at risk of falling into a period of price deflation, as explained by the minister. This could mean further job losses, falling profits, shrinking incomes, and increasing defaults on loans; further shrinking the tax base as deflation always idles production capacity. With deflation comes the loss of value in stocks, property, and commodities. Such a scenario will see a lot of people holding cash. With the multiple currency system the ability of printing more money as a preventive measure against deflation is non-existent. It was surprising however that the minister did not detail the preventive measures; maybe he is leaving that to the Reserve Bank of Zimbabwe’s monetary policy statement, but at least some statement would suffice. A number of measures should therefore be put in place including recapitalising the banks, and obviously improving investment inflows. One of the key points set out in the budget is the issue to do with the resolution of Zimbabwe’s external debt which the minister said is an impediment to normalising the relationship with international creditors, and undermining the country’s creditworthiness. Strict implementation of the Zimbabwe Accelerated Arrears Clearance Debt and Development Strategy becomes a priority and this would be the key in convincing international lenders about the country’s level of seriousness in resolving the country’s obligations. At this juncture it is very important that the government does not deviate from the staff monitoring programme as well as working in strategic partnership with the IMF and World Bank. It is a fact that the world will never change so as to accommodate Zimbabwe’s demands, and our present situation will never have a bearing on the global economic system, thus unfortunately we have to adhere to the demands of that system. It is clear that the Government’s policy agenda in this budget going forward focuses on growing the economy, creating jobs in the process and providing social security for Zimbabweans as can be seen by the proposal to set up a Sovereign Wealth Fund, as well as the restructuring of National Social Security Authority to focus more on investments that create value for policy holders. However we believe that rather than create a new SWF altogether a more appropriate scenario would have been transforming NSSA itself into a Sovereign Wealth Fund. NSSA already has the assets, cash flows, infrastructure, investment expertise, a decent balance sheet, and it is the only quasi-government entity with the ability to go onto the international market for a bond issuance. The critical question is how will a new SWF going to be funded? The National Indigenisation and Economic Empowerment Fund is already highly leveraged and will definitely take a number of years to get it to be cash positive. The budget is also targeted at improving the livelihoods of the people through the provision of improved social services like health care; education and training; and early childhood development. Indications are that improvements have already been registered in most of these areas and this is rightly an indication of progress. One thing the minister highlighted which is of concern to the majority of Zimbabweans in general is the lack of accountability in diamond mining, with zero diamond revenue being received by treasury. What seems to be the case is the awarding of diamond mining concessions to entities lacking both the requisite expertise and capital. An ideal scenario would have been the auctioning of diamond mining concessions to investors, with the concession going to the highest bidder. This process is in itself transparent and would have at least guaranteed revenue to the government. The process could also include other minerals like platinum, tungsten, gold, coal, and iron ore. The auction process would to a certain extent include securitisation of these resources, with repayments offset by future revenues and royalties expected from the eventual sale of the commodities. If this is done in transparently, the economy will benefit tremendously. The truth of the matter is resources no matter their value, are useless so long as they remain in ground. The current selection criterion for Zimbabwe Mining Development Corporation partners is questionable and inefficient. It is therefore critical that the proposed policy guidelines on joint ventures be gazetted by the proposed February deadline and these should be enforced to the later. The minister is right in highlighting the need to support productivity in the manufacturing sector as any other measures to curtail imports could potentially be catastrophic for the economy as there is no adequate capacity by local manufacturers to fill the demand-supply gap that has necessitated the increase in imports. The minister should have earmarked more financing to support low cost financing for the manufacturing sector by re-looking and repositioning the distressed companies fund, into a fund that invests in distressed debt. While some imports are luxuries, the bulk of them are food items. Guaranteeing food security will also reduce our food imports. The planned national irrigation development fund is a good start towards increasing the total hectares under irrigation from the present 200 000 hectares. The fund should play a key role in improving the production of crops locally, but given that Agriculture is the main driver of the economy the funding earmarked in our opinion is inadequate. The Government is taking a step in the right direction by resolving the issues surrounding the RBZ. The focus will be on capitalisation, assumption of RBZ debt, and restoration of lender of last resort. It is important that the minister adheres to his own set targets in regards to the RBZ, as this in a way is a confidence booster. The minister also proposed a US$100 million interbank programme supported by the African Export Import Bank, which is a good initiative, but the quality of assets sitting on the balance sheets of some banks might hinder the programme. Bringing confidence to the banking sector in our opinion takes more than an interbank programme. What is needed and critical at the present momentum is a realistic solution as to the way forward regarding the toxic assets sitting on most banks balance sheet which is potential future problem that is brewing. At 15 percent the non-performing loans are too high and a drag on the performance of the financial services sector, and this needs to be corrected at the earliest as the domino effect of bank failures could be catastrophic to an economy. Failure to rectify this issue will only save to worsen the liquidity situation with banks failing to honour deposits on demand leading to bank runs and more failures. While the minister was correct in his assessment of the bearish sentiments of the local stock market and the limited participation of local investors. The lack of investment by local investors is as a result lack of domestic savings including pension arrears and to a certain extent low levels of disposable incomes. One of the major concerns in the budget statement is the resumption of the Fidelity Printers and Refineries as the sole buyer and exporter of gold. Monopolies never work and in most cases distort the market. This policy shift in the long term will lead to depressed local gold prices thereby we shall see an increase in the smuggling of the precious minerals. The minister reiterates the allocation of resources to curb smuggling but at what cost? This could defeat the whole purpose of growing the economy as we shall witness a reduction in investment in gold mining as historically Fidelity Printers and Refineries has failed the gold industry. An ideal situation is promoting competition in gold buying so as to promote fair pricing and enhancing the development of the sector. The long term desire of this government is to reduce recurrent expenditure to 30 percent of the budget by 2018 down from 70 percent and to achieve a GDP growth rate of 6 percent for the 2014 fiscal year. This is a major shift from a focus on recurrent expenditure to a growth oriented policy promoting infrastructure projects, with a strong emphasis on power generation, which in turn creates employment and over the long term increases aggregate demand. The action taken by the finance minister in the Government’s first budget post Government of National Unit is aimed at maintaining stability, restoring confidence and sets out a strategy to put the economy on a course to long term growth. It is why one of the most critical comments to come from the minister is what he termed as confidence building measure to try and turnaround the economy. What would be crucial in boosting confidence would be transparency, policy consistency, and strict adherence by ministries to budgetary allocations. In the long run this will help the country develop a positive track record in governance, economic management and restore investor confidence. It is worth mentioning that the government has taken the doing business reforms seriously, however in our opinion the need to have an organisation like Zimbabwe Investment Authority itself goes against the grain as it is not necessary to have a parallel approval process? ZIA should just focus on investment promotion and facilitation. Over the long term reduce donor dependency of the National Budget by replacing these with funding from royalties received by treasury in the mining sector. This means vigorous promotion of investment in the mining sector. Increase capital expenditure on technology, equipment and machinery in agriculture that benefit smallholder farmers.